Nothing mobilizes gun owners faster than taking our message up on TV, radio and the internet. 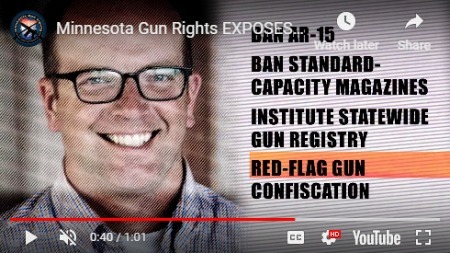 And with radical anti-gun candidate Brad Tabke enjoying the support of Bloomberg’s Gun Control groups as they attack staunchly pro-gun candidate Erik Mortensen in the final days of this election cycle, gun owners in Minnesota need to stand up! The fact is, Brad Tabke is the most anti-gun candidate running in this 2-year cycle. He supports every gun control proposal that you can think of. From “Universal Gun Registration”, to AR-15 bans, to Bumpstock and Standard Capacity magazine bans, to “Red Flag” gun seizure legislation, he wants it all! On the other hand, Erik Mortensen is promising to do what no other legislator has done in Minnesota for YEARS… that is FIGHT for passage of Stand-Your-Ground and Constitutional Carry law, not just pay lip service to gun owners by introducing pro-gun bills and letting them die, like so many other “pro-gun” legislators have done. If we are ever going to see pro-gun bills advance in Minnesota, we need someone in the legislature who is willing to FIGHT for gun owners, NOT legislative leadership. But we need to make sure that every gun owner in Shakopee knows it, and fast! We are already working hard to get the word out by direct mail, email and in-district lit drops, but we need to kick it up a notch. That’s why we just finished production on the ad you see below — check it out here. It was radio and internet ads like this that awakened an army of gun owners in 2016, who then went on to boot Rod Skoe and Lyle Koenen out of office in the State Senate, flipping the chamber. So we know that these ads are effective. The order has already been placed to blast these ads across the airwaves in Shakopee, but I need your help to fund them! Please help fund whatever you can right away! If the Bloomberg-backed gun control crowd is able to attack Minnesota’s leading pro-gun candidate for his support of our freedoms with no push back, they are going to be downright unhinged as we approach the 2019 session. We need to push back now! Please help us get this ad up on the air! P.S. Gun control radical Brad Tabke is going all out as he tries to punish pro-gun candidate Erik Mortensen for promising to FIGHT for gun owners in St Paul! You and I can’t let his plan to disarm Minnesotans remain a secret! That’s why we have finished production on this ad and are blasting it across the airwaves in Shakopee, to make sure gun owners have the facts! We need to get these ads up on the air in Shakopee right away! There’s no time to spare. Please help us fund one or more of these ads right now!